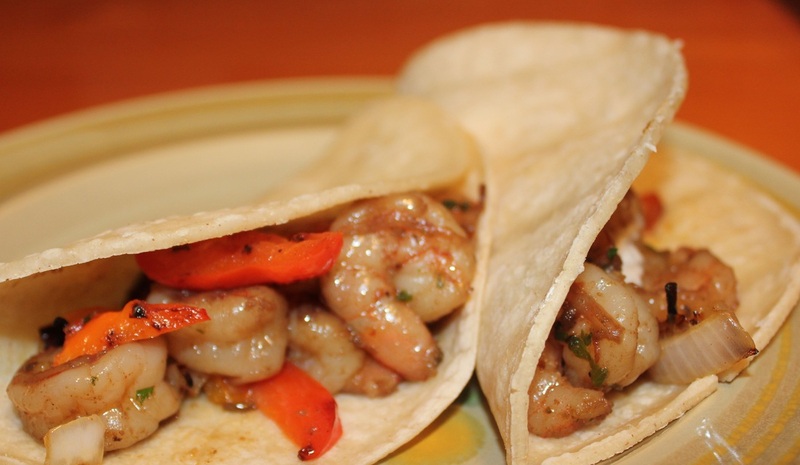 Sumptuous shrimp fajitas are fantastic, easy to make, as well as healthy. They are so easy they make a terrific last minute meal. Defrost the shrimp if frozen, devein, remove shell and tails. Place shrimp in a glass bowl. Add the garlic, lime juice, cilantro, chilies, cumin, chili powder and coriander. Mix well and refrigerate at least 30 minutes. Wrap tortillas in foil and heat in a 300 degree oven for 15-20 minutes. Heat a large skillet over medium high heat add the oil and saute the bell pepper and onion until tender. Set aside. In the same pan stir-fry the shrimp until pink and tender. When the shrimp is done add the vegetables back to the pan, stirring until warm. On each tortilla, place a portion of shrimp and vegetable mixture. Serve warm. You can serve these fajitas with salsa, avocado and sour cream if you wish. I like them just as is!